No fire this time. But a custard cake. And mosaic. 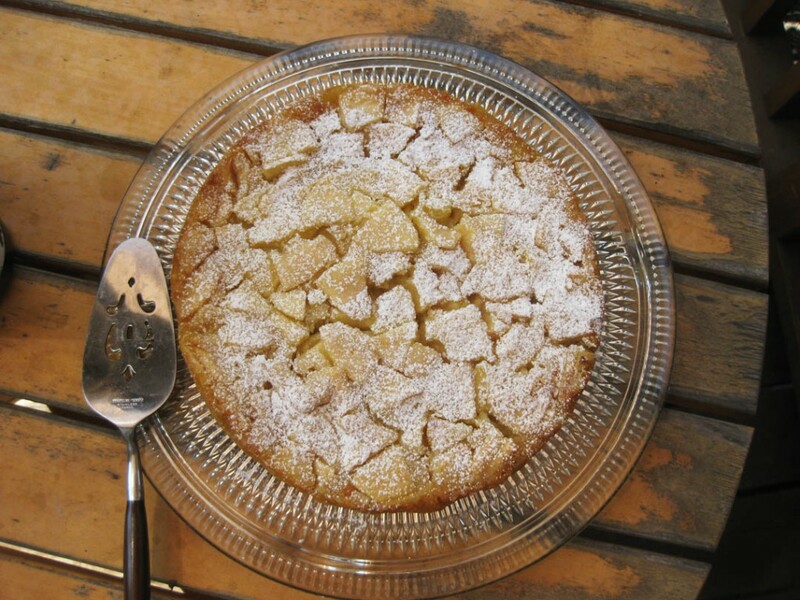 RECIPE: French apple custard cake. They really should have mentioned the problem with the pan. I picked up a recent issue of Cooks Illustrated and look! 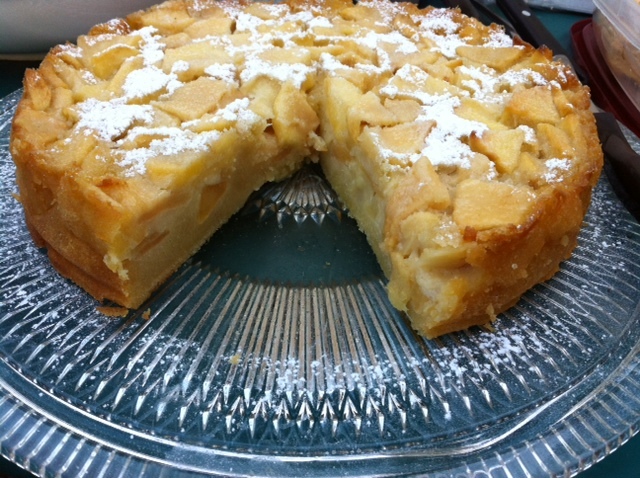 A recipe for apple custard cake. Wow. Although there were two pages of nice narrative about the science of this cake, which I love, NOTHING mentioned potential pan issues. It’s not like I have a history of pan trouble or anything. Which left me nearly weeping and declaring, “I’m never baking again!” Sprawled out on the kitchen floor. Kind of like people do with a hangover and drinking. Promising never, ever again. Swear it. So my cake looks nothing like the lovely Cooks Illustrated cake. Because, you know, half of mine leaked out the bottom of the pan. Yes, I scraped the dregs off the tinfoil and ate it anyway. But still. But we had a BBQ to attend. And Ken said to just bring the cake anyway. So I did. Reluctantly. It was more custard than cake. And people loved it. Suckers. To finish the BBQ evening Ken and I embarked on finishing a small project. Correction: what we’d hoped would be a small project. An outdoor stone mosaic with rocks I’ve collected. You’ll note that although this was my big idea, it’s actually Ken doing all the hard work. Hee. RATING: Eating the custard cake anyway? 5 of 5. Getting a new pan? Essential. 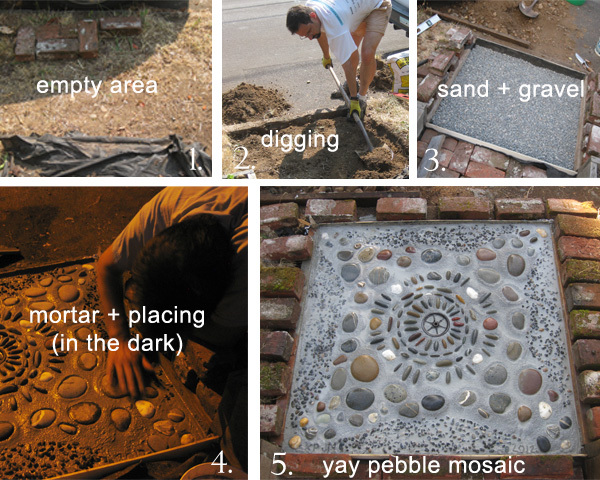 Trying outdoor projects even in super hot summer weather and when you finish in the dark? High five. And a beer. RECIPE: I’m thinking you actually need to use the Cooks Illustrated version instead of my personal oven-mess rendition. Enjoy! 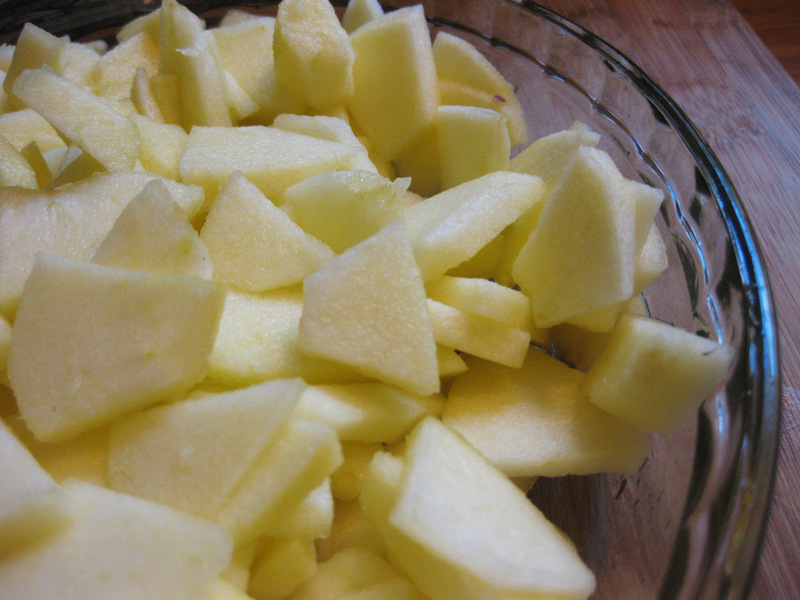 1 1/2 pound apples: Granny Smith. Peeled, cored, cut into 8 wedges and sliced 1/8 inch thick. Adjust oven rack to the lower middle position and head oven to 325. Spray 9 inch springform pan with vegetable oil spray. <JEN’S NOTE: Be careful with the pan. Do you have a good leak-proof one? Awesome. If not? Line the outside of the pan with tinfoil, tightly. The bottom and sides. To help prevent leaking.> Place the prepared pan on a rimmed baking sheet lined with foil. 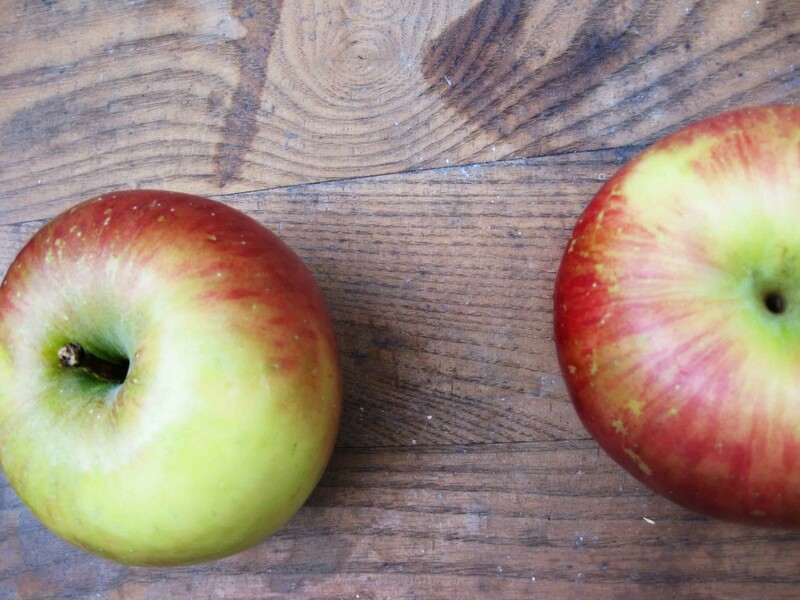 Place apple sliced in microwave safe bowl and microwave covered until pliable. About 3 minutes. Toss with Calvados and lemon. Let cool for 15 minutes. Whisk 1 C flour, 1 C sugar, baking powder and salt together in a bowl. In a separate bowl, whisk 1 whole egg, oil, milk and vanilla. Add dry ingredients and whisk to combine. Transfer 1 C of the batter to a separate bowl and set aside. In remaining batter add egg yolks and whisk to combine. Using spatula, gently fold in cooled apples. 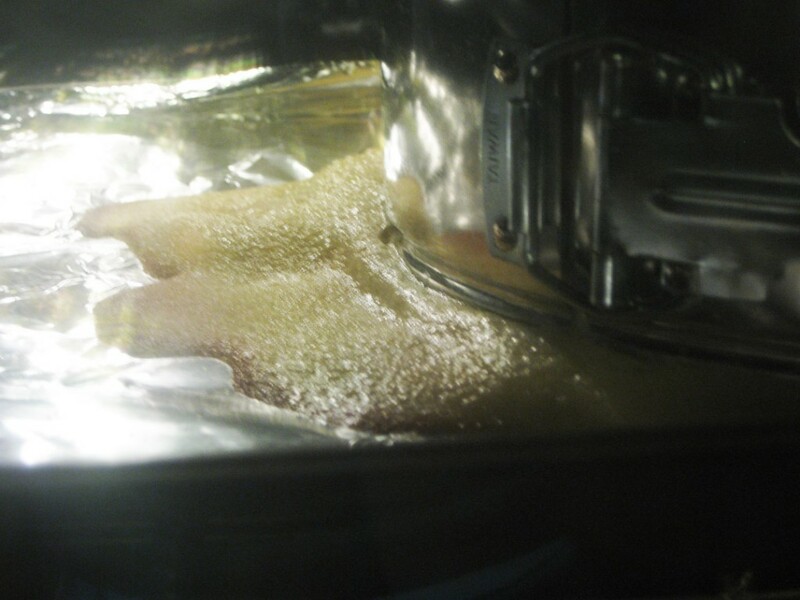 Transfer to pan, evenly, in a compact layer with a smooth surface. Whisk remaining 2 tbsp flour into the reserved batter. Pour over batter and spread evenly on top with a smooth surface. Spring remaining 1 tbsp sugar on top. Bake until center is set or until toothpick comes out clear. About 1 hour and 15 minutes. Transfer pan to wire rack to cool, 5 minutes. Run pairing knife around sides of pan to remove it and let cake cool completely, 2-3 hours. Dust lightly with confectioner’s sugar and serve. Add 2-3 hours to the time, to allow it to cool. This entry was posted in 5 Wine Glasses, Dessert, Vegetarian and tagged apple, cake, custard, french, mosaic. Bookmark the permalink. One Response to No fire this time. But a custard cake. And mosaic. I want the recipe, but when I clicked on your link, I had to fill out email info to be on the list. Could you please just post the recipe. Thanks.